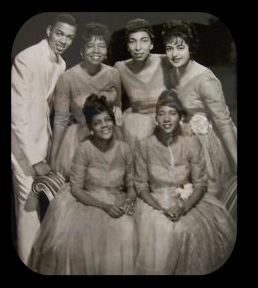 There have been many female groups dominating Gospel music over the past 50 years. However, none can compare to the impact made by The Legendary Caravans. 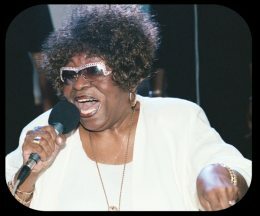 Founded by the Queen of Gospel, Albertina Walker (a title justly fitting and well deserved) in 1952, this group during its reign featured various gospel powerhouses including Shirley Caesar, Dorothy Norwood, Inez Andrews, Bessie Griffin, James Cleveland, James Herndon, Deloris Washington, Cassietta George and Josephine Howard. They recorded a number of albums for Savoy and Vee Jay producing such classics as "Sweeping Through The City", "What Will Tomorrow Bring", "To Whom Shall I Turn", "Hallelujah Tis Done", "The Solid Rock" and others. 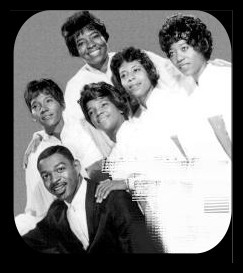 Their music has been covered by the likes of Dr. Charles G. Hayes and the Cosmopolitan Church of Prayer Choir, The Clark Sisters, Aretha Franklin, and most recently, the group RiZen. 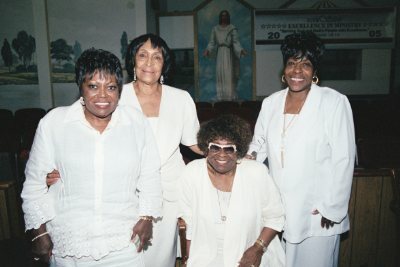 And so it was, on Saturday, August 27, 2005 (two days before Albertina's 76th birthday) that Deloris Washington, Inez Andrews, Albertina Walker and Dorothy Norwood came together at Chicago's West Point Baptist Church to relive the music and create new and lasting memories to be captured on disc. Dorothy Norwood had conceived the idea to bring the "girls" together for a reunion recording over a year ago, but with everyone's schedule being hectic, it was a dream deferred. Even with this session's recording , Shirley Caesar's absence was clearly noticeable. Despite this, the Caravans set out to accomplish the task set before them. With Norwood in the producer's seat, capably assisted by Savoy Records' Rev. Milton Biggham, they were off to a great start. The first thing that struck me was that this was supposed to be a closed session. CAN I TELL YOU there were more people at this session than 'a few'? Some had flown in from as far as Miami, Florida to be a part of the historic event. 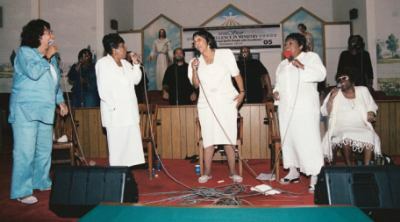 Dorothy Norwood shared these reflections with GOSPELflava.com: "Having done various live sessions and having to start and stop several times, we felt it would be better with a closed session, having a 'live' feel, but allowing the singers and musicians to be comfortable and not under the pressure of having people sitting there, critiquing us and carrying on. Thanks be to God, we didn't have to start and stop very much and the Lord just had his way." Assiting in the effort were some of gospel's greatest musicians, dubbed by Norwood as the "Big Boys": Derrick Lee (of Bobby Jones fame), Richard Gibbs (son of Inez Andrews and regular accompanist for Aretha Franklin) and Al Willis. Background vocals were done by a Chicago's own Just Friends. The Caravans took us down memory lane doing classics as "Remember Me, Oh Lord", "Mary, Don't You Weep" (with Inez walking the aisles and calling Mary as if she were a vibrant 35 year old) and "Lord Keep Me Day By Day" (a signature song for Albertina that moved many in attendance to their feet). Artemis Gospel's Evelyn Turrentine-Agee was a perfect guest for this session. She picked them up and put them down interpreting The Caravans' "No Coward Soldier" (listening to her made me wonder, How was it that she was not a Caravan back in the day, what was SHE DOING?). In addition to the standards, we get an offering of six new songs; featuring Albertina leading "He Fixed It" (written by Milton Biggham) and Deloris Washington taking the mic on "(Lord, Let Your Will ) Be Done". Dorothy Norwood solidified her position as one of the world's greatest storytellers on "We Paved The Way". " This song has HIT written all over it", said Andre Gates, one of the witnesses in attendance. "God allowed this to happen for a time such as this. The Caravans were in rare form and this project will be one of the most anticipated projects for the year 2006", he commented. Dorothy Norwood made mention of the fact that plans are in the works for a tour to support the CD release. So, in addition to hearing this music, Gospel music lovers everywhere will be afforded the opportunity to see these ladies perform together again. Here's hoping that they'll be sweeping through a city near you!